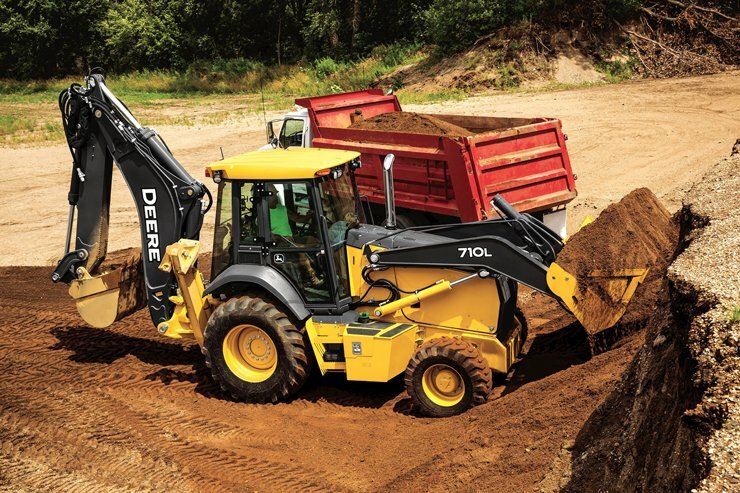 Built in the world-class John Deere Dubuque Works, Iowa, manufacturing facility, the 710L joins the popular L-Series lineup of backhoe loaders. The latest model offers a robust 17-ft, 3-in. 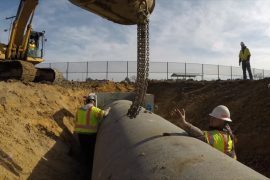 dig depth, the largest in the John Deere portfolio, and it is ideal for loading trucks, placing pipe, digging trenches, breaking up concrete or asphalt and moving materials. 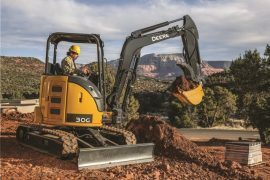 The 710L backhoe meets today’s emission regulations through an EPA Final Tier 4/EU Stage IV-certified 4.5L Deere PowerTech Plus engine, providing 13 percent more net peak horsepower (148 hp/110 kW) than the previous K-Series model. 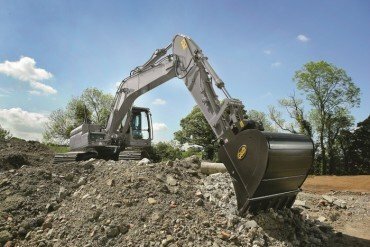 Other hallmarks of the 710L include a standard John Deere PowerShift transmission that enables operators to travel up to 23 mph (37 km/h) between jobsites. 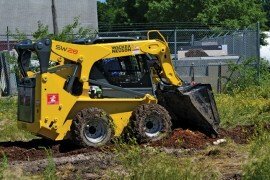 Utilizing the sealed-switch module (SSM), operators can get an additional 10 percent craning boost through the Lift Mode feature; when selected, engine rpm is automatically set at 1,400, and the machine maximizes hydraulic pressure for increased craning capability. 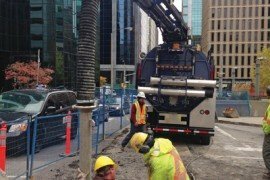 Pressure-compensated load-sensing (PCLS) hydraulics ensure superb multifunction operation. 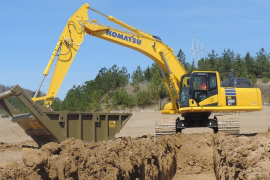 Standard ride control enables front loader hydraulic cylinders to act as shock absorbers, smoothing travel over rough terrain, helping full loads reach their destination and reducing operator fatigue. Inside the cab, operators will enjoy features prevalent on L-Series models, including extra legroom and a more comfortable seat, redesigned pilot towers with fingertip electrohydraulic (EH) controls, a multifunction lever on the steering column to control turn signals, wipers and lights, and a state-of-the-art multi-language monitor. Operators can program time-specific functions, such as auto shutdown and auto idle. Other enhanced 710L backhoe creature comforts include an efficient heating, ventilation and air conditioning (HVAC) system, adjustable mechanical or air-suspension seat, a new lighting scheme with an optional light-emitting diode (LED) lighting kit to enhance visibility to extend the workday and an elevated canopy to provide better visibility for both the front and rear of the backhoe. The 710L also has the option to add premium radio with Bluetooth auxiliary input and SiriusXM satellite radio capability. 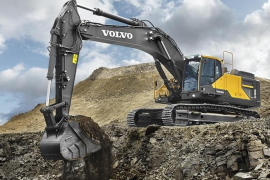 The 710L also boasts the benefits of unsurpassed reliability and uptime. Same-side ground-level service points help speed daily checks. 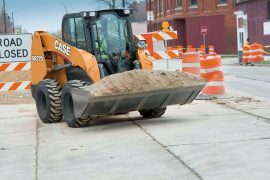 Other common-sense features, such as extended service intervals, simple-to-read sight gauges and easy-access grease points, help increase uptime and lower daily operating costs. Owners looking to get the most out of their 710L can rely on Ultimate Uptime featuring John Deere WorkSight. 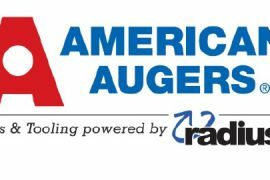 With Ultimate Uptime, operators receive pre-delivery and follow-up inspections; three years of JDLink telematics, machine heath prognostics and remote diagnostics and programming capability; and the ability to add additional dealer-provided uptime solutions to customize the package to individual needs.